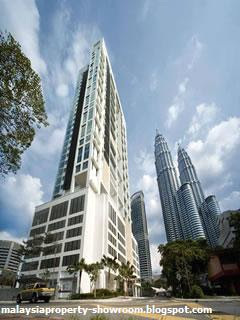 The Meritz developed on a 0.75-acre freehold land, located near the Petronas Twin Towers and the Suria KLCC Shopping Centre. Each of the 110 units within this 31-storey glass-encased tower is an elegant home, created for those who appreciate the finer things in life. Situated next to the Putra LRT KLCC station with easy access to major expressways, this luxurious development makes traveling to all parts of the city a breeze. Facilities include Lap pool, Children's swimming pool, Jacuzzi, Sauna, Children's playroom, Children's playground, Gymnasium, Seating terraces, Barbeque area, Pavilion corner, Games room, Multi-purpose/function room. Built-up Area : 1,066 - 3,412 sq.ft. Developer : Tanahniaga Sdn. Bhd.